No boys allowed: Girls Who Code takes on gender gap #WomenInSTEM « Adafruit Industries – Makers, hackers, artists, designers and engineers! Each morning this summer, Jazmine Fernandez hopped the subway to downtown Oakland and boarded a shuttle bus bound for Silicon Valley. The youngest of four raised by a single mom who works at Burger King, Fernandez, 18, is a high school senior growing up in the hulking shadow of the Oakland Coliseum. She likes to study mechanical engineering and build robots in school. A couple of friends suggested she apply for Girls Who Code. The non-profit is part of a nascent but growing movement to close the gender gap in the technology industry. Fernandez had never known any software engineers. She wasn’t even sure Mexican Americans could get jobs with big technology companies. “I thought I wasn’t smart enough. I thought I couldn’t do it,” she said. 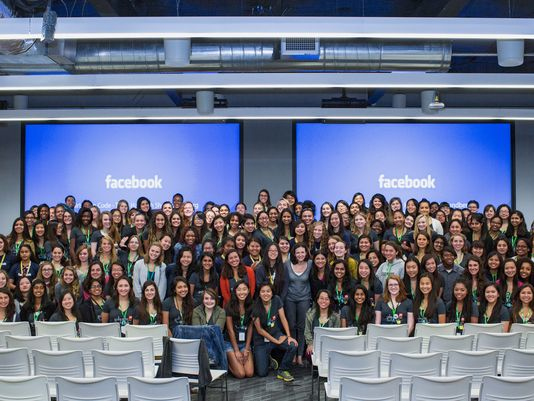 One of 20 teens to spend seven weeks on the Facebook campus in Menlo Park, Calif.​, with Girls Who Code, Fernandez got a crash course in computer science. She went on field trips to top tech companies. And she attended workshops run by leading female engineers and entrepreneurs. Fernandez says her self-doubt melted away when she met Raquel Vélez, who is a senior software developer at npm Inc., an open-source software company. For the first time Fernandez says she can picture herself working for a company like Facebook. “Now I can really say that I can do this,” Fernandez said. Launched in 2012, Girls Who Code’s summer program has grown from 20 girls in one classroom to 380 girls in classrooms at 16 companies across the country. Founder Reshma Saujani says she’s determined to reach 1 million girls by 2020. Saujani is addressing a pressing challenge for the tech industry: There are not enough computer science graduates to fill openings. Nearly three-quarters of girls in middle school express interest in engineering, science and math. Yet, by the time they are in college, very few major in computer science. Fifty-seven percent of bachelor’s degrees are earned by women but just 18% of computer science degrees go to women. Women make up half of the U.S. workforce but hold just 25% of the jobs in technical and computing fields. The figures are even starker for women of color. Black women make up just 3% of the computing workforce and Hispanic women just 2%. Saujani says the tech industry needs to find a way to engage the other half of the U.S. population. And so far the results from Girls Who Code show that early intervention is the key, she says. Of the graduates from the Girls Who Code summer program in 2013, 95% said they were definitely considering or were more likely to consider studying computer science in college, and 99% said they were considering a career in technology. Saujani, the daughter of two engineers who were refugees from Uganda, hit on the idea for Girls Who Code during her failed run for Congress. As she visited schools on the campaign trail, she noticed the same thing again and again: few if any girls in computer science classrooms. Championed by high-profile executives such as Facebook’s Sheryl Sandberg and Square’s Jack Dorsey, Girls Who Code has gotten off to a quick start.